It has been said “Necessity is the mother of invention.” Such was the case for Giuseppe and Nanette Galloni. Originally from Sicily, the Galloni’s came to Sarasota by way of Venezuela. In the early 1980’s, authentic Italian groceries, meats, and cheese, were hard to find locally. Living in Sarasota yet yearning for the foods of Italy, the Galloni’s decided to source their own Italian specialties. In December, 1984 Casa Italia was launched and Sarasota had a new Italian specialty food market. 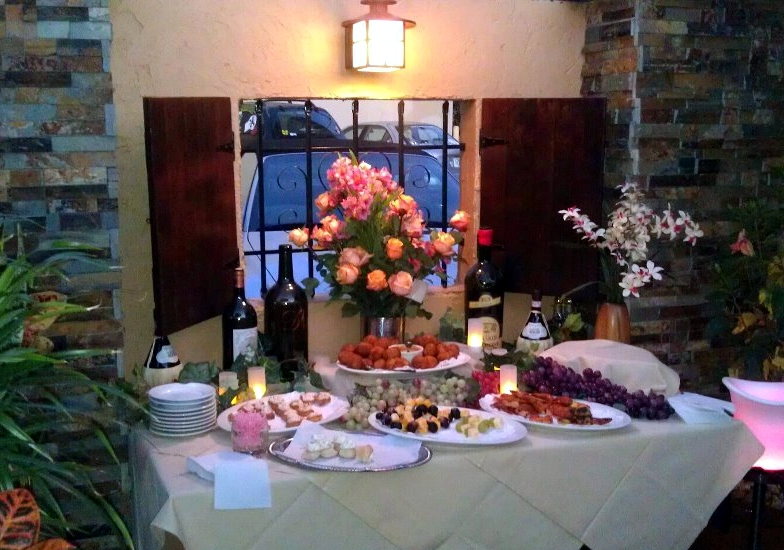 Casa Italia’s 28th anniversary was celebrated in December, 2012. 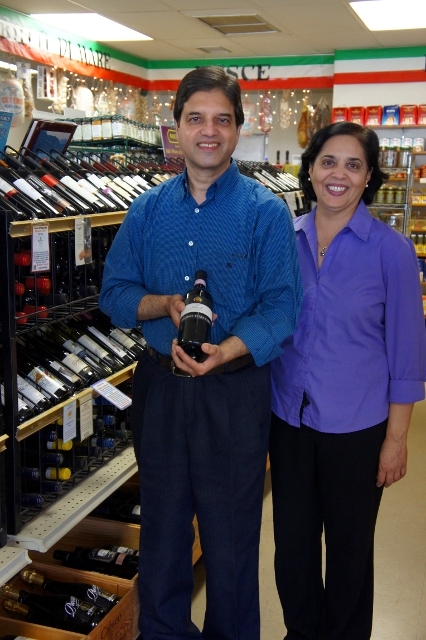 JLQ: So how does an Indian couple living in London come to Sarasota and wind up owning an Italian specialty market? Raj: Nita and I were raising our family in London, had traveled throughout Europe, and wanted to include the United States in our travels. In 2001 we visited the US for the first time and immediately thought this was a place where we could live. In short order, we made the decision to move to the US. If we owned a business in the States, the immigration issues would be less complicated. So we returned to Florida in February, 2002 with the intention of finding a suitable business to purchase. We traveled throughout the state exploring various businesses and locations before the Casa Italia opportunity was presented. JLQ: And then what happened? Raj: Nita and I share a great passion for food. We traveled throughout Europe sampling and tasting various cuisines. We were/are particularly fond of Italian cuisine. So the thought of owning an Italian specialty market seemed like a good idea. In fact, it felt right! Since my professional training was accounting, I was able to examine the numbers from the Casa Italia business and quickly determine the viability of our idea. We decide to purchase the business and put our plans in motion. JLQ: That was a big step to take. Tell me about the challenges in making such a change. ues to be resolved before we could physically move. JLQ: So in essence you bought a business and with it a new life? Raj: Yes indeed, we changed professions, country, and lifestyle, as a result of this singular move. JLQ: So the deal is complete. You move to Sarasota and then what? JLQ: Did you have any hesitations once you were here? Raj: No, not really. We were very enthusiastic about the business, the opportunity, and the products. We gradually expanded the number of products we were offering. Additionally, we saw an opportunity to offer “grab and go” prepared foods. Chef Frank Silvestro introduced himself to us and offered some cooking demonstrations at the store. Since the food was well received by our customers, we started to offer prepared Italian dishes weekly. With today’s busy lifestyle, the prepared food is a big hit for us and our customers. JLQ: I could not help but notice the selection of Indian dishes in the prepared food section. How did this come about? a try. It was a big success. Today, the classes are a regular part of our business. 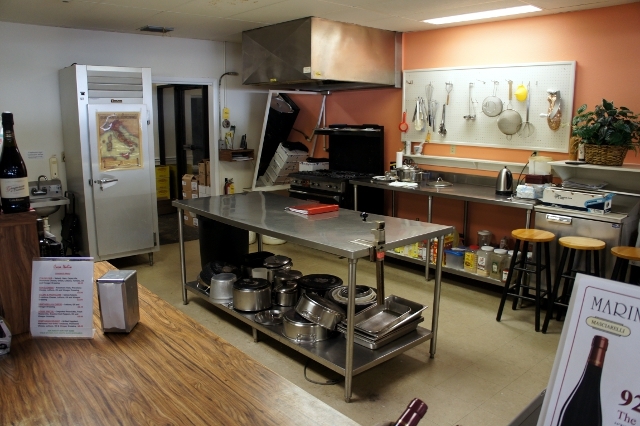 We also have a small section, in the back of the store, where customers can buy Indian spices for their own food prep. And of course we offer “grab and go” prepared Indian dishes on Fridays. JLQ: Adding Indian products and prepared foods certainly projects an international feel. Raj: Yes that is true. Casa Italia’s Italian roots are deep but over time the products have become more international. For instance we not only offer olive oils from Italy but also from Spain. The same is true with our cheese, meat, vinegar, and almost all products. In fact just the other day I noticed we had a product from Iceland. So I guess you can say we have become an international specialty market. JLQ: So where is Casa Italia going in 2013? Raj: Since our Italian and Indian cooking classes have been so well received, we plan on doing more this year. We will continue to offer a wide range of unique, high quality food products. We are in the process of expanding the frequency of our wine tastings as well; so customers can expect more tastings in 2013. JLQ: Thank you Raj and Nita for your time. I enjoyed learning more about Casa Italia and your adventure to Sarasota. Raj & Nita: Thank you Jack. It was our pleasure. When I heard through the “Sarasota Dining Grapevine” Executive Chef Pedro Flores from The Table Creekside was also going to oversee the menu at Phillippi Creek Restaurant & Oyster Bar; my ears perked up. This Dine-mark™ restaurant has a large, long standing, loyal customer base, carefully cultivated, and comprised of people from Sarasota and visitors alike. So what changes could one expect? What about the menu? Additions? Deletions? This menu thing could be tricky and fraught with unintended consequences. I heard there were a number of new items already on the menu, so I decided to go to Phillippi Creek Restaurant & Oyster Bar and check it out. When we first arrived it was busy, but were able to get a waterside table. 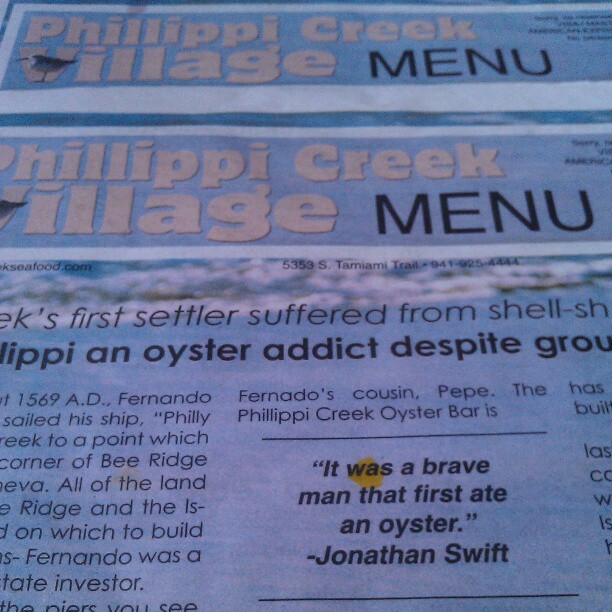 The typical Phillippi Creek newsprint menus looked the same, but upon further examination, we noticed a number of positive changes and additions. 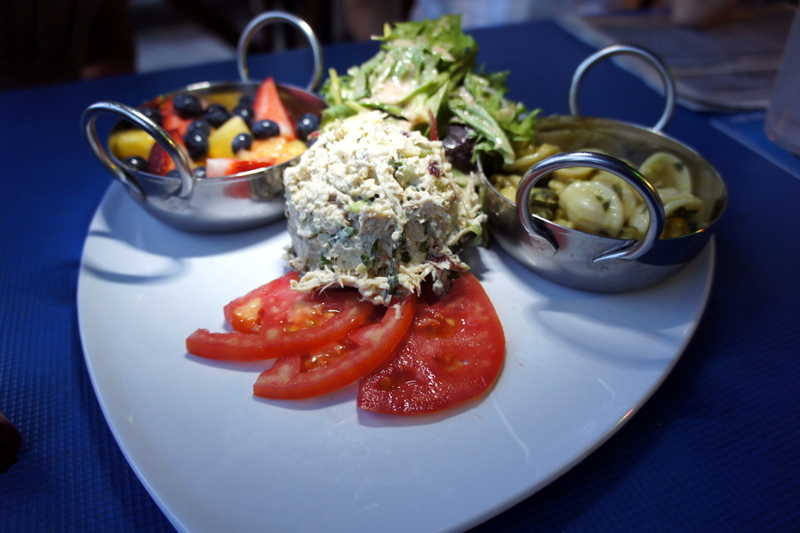 Fresh, colorful, full of flavor, the chicken salad had some fruit mixed in but was not sweet, just the way we like it! A great starter for sharing. This was a big piece of grouper, stuffed full with visible bits and pieces of shrimp, scallops, and crab. What an outstanding presentation of 3 fish individually placed on a cedar plank, colorful, full of various flavors, can easily be shared. Although not brand new to the menu, it is relatively new and underscores the theme of fresh, new, exciting presentations. 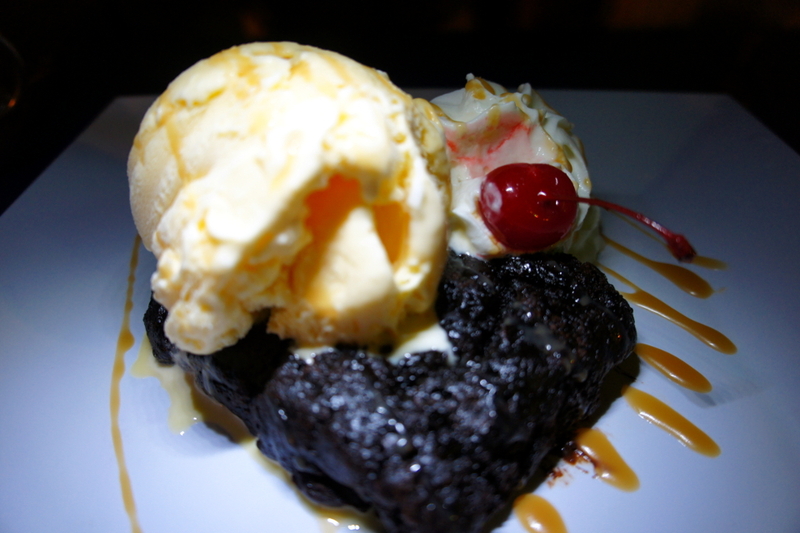 A dark, warm, rich, moist, chocolate brownie with melted swirls of vanilla ice cream and caramel…one word…WOW! If you are like me, every year Thanksgiving seems to come upon us with little to no notice. This year is no exception. I cannot believe we are only days away from Thanksgiving and the start of the holiday season. 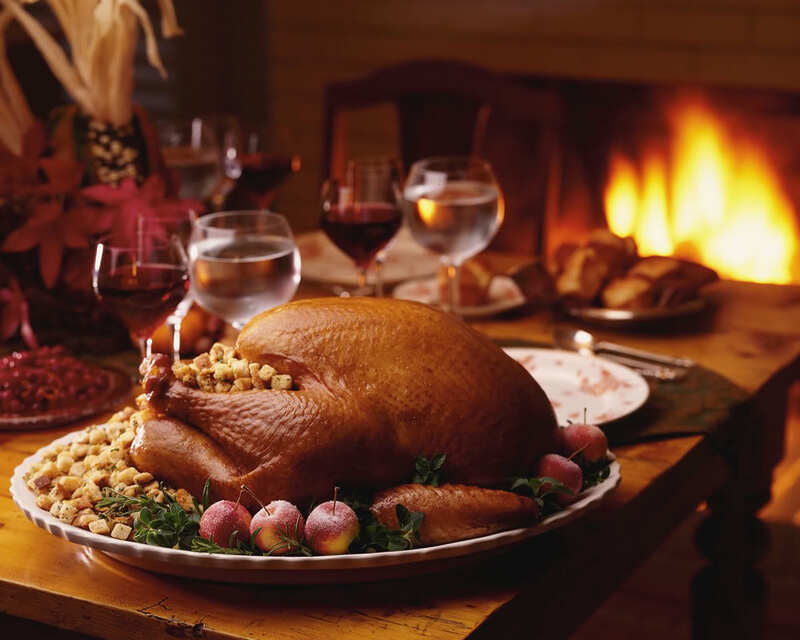 Each year we highlight some Thanksgiving dining options for you to consider. Despite the short notice, this year is no exception. A traditional home cooked Thanksgiving meal. Morton’s Gourmet Market is offering fresh Bell & Evans turkeys and Eberly Farms organic turkeys. Call 941-955-9856 to place an order. The Butcher’s Block is offering Amish turkeys for pick up. Call 941-955-2822 to place an order. Whole Foods Market offers a wide selection of Heritage, heirloom, organic, or kosher turkeys. You can also special order a chilled brined turkey. The Fresh Market is offering a 1-stop shop for all of your Thanksgiving needs. The Mozzarella Fella, a new addition to Sarasota is offering Italian specialties, side dishes, and catering for Thanksgiving. Call 941-366-7600 for more information or to place an order. One of the best dining views in Sarasota! For some, the thought of planning, preparing, and serving a large holiday meal is daunting. Not to mention the clean-up which is part of the process! Fortunately, Sarasota is home to many fine restaurants offering options for Thanksgiving Day Dining. The Polo Bar & Grill will be offering a Thanksgiving Day Buffet from noon till 5:00pm, $35 per person, $14.95 for children under 12. Call for reservations 941-782-0899 ext.2. No matter what the choice, one thing is clear; we wish you the very best Thanksgiving. Enjoy! Now in its seventh year, the Savor Sarasota Restaurant Week, presented by Visit Sarasota County, starts on June 1, 2012 and runs through June 14, 2012. A foodies’ favorite enjoyed by visitors to Sarasota and the people who live here, participating Savor Sarasota restaurants offer specialty0priced multi-course lunches for $15 and dinners for $25. With more than 35 restaurants participating, the breadth of cuisines, style of restaurants and the various locations within Sarasota County provide a range of selections sure to please your palate and dining budget alike. As with any special offer, there is limited time to take advantage of it. 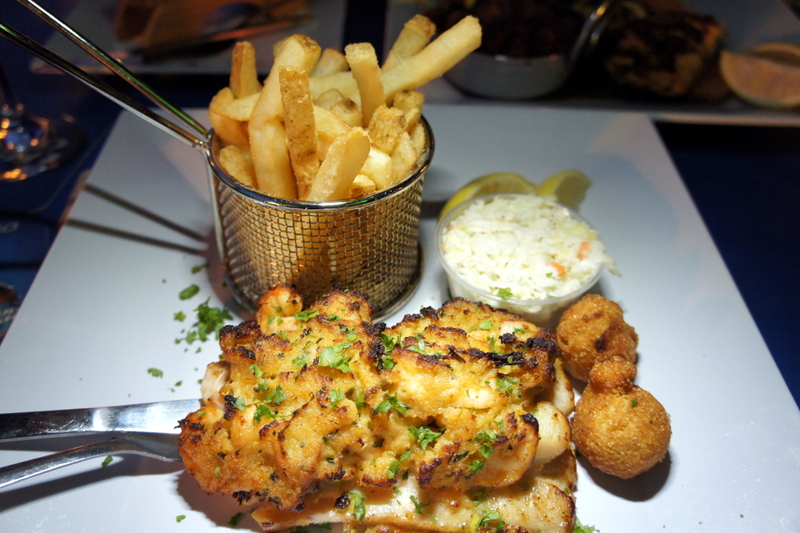 So why not act now and explore some new dining spots in Sarasota? Your tastebuds and wallet will shower you with appreciation! The Fresh Start Café, one from an abundant crop of new Sarasota restaurants, recently opened in the Burns Court area. Founded by business and life partners Rochelle Seldin and Hanna Schneider, the restaurant represents a new beginning for each. Rochelle, a singer, entrepreneur and entertainer, longed for another opportunity “to do her own thing” and work for herself—to make a new beginning. Hanna, after taking a hiatus from the food service business to focus on the couple’s young family, wanted to put her culinary skills back to work. The seeds for the Fresh Start Café were germinated. Very fresh, subtle flavor; great with morning coffee. Very light and flavorful, sweet but not overdone; another great accompaniment to coffee. Very interesting pastry; a non-sweet baked good alternative, simple yet flavorful. A very nice presentation: eggs perfectly poached, colorful, flavorful, and the toast was great. A very filling, flavorful alternative to the omelet; nice presentation, delicious. Fresh and full of subtle flavors and texture; nice presentation. A well-prepared and presented sandwich served with a side of couscous. Very flavorful and filling, served with a side of pasta salad; simply delicious. The Fresh Start Café offers a limited selection of beer and wine to accompany your meal, while offering a good selection of coffee, tea and soft drinks. The wait staff is very friendly, accommodating, fast and efficient. Perhaps the Fresh Start Café is an insider’s place, mostly discovered by locals in the Burns Square and Palm Avenue areas. However, the word is getting out about the quality of the food, and the Fresh Start is becoming a very busy spot for breakfast, lunch or just for coffee—another welcome addition to the Historic Burns Court neighborhood. Has this ever happened to you? You are reading a menu in a fine restaurant. Everything sounds delicious. Making a decision on what to order is difficult. You are relying on the item descriptions and preparation to assist you; however many of the terms being used are ones which are unfamiliar to you. Well it has happened to me and let’s face it, there are only so many times you can request assistance from the waiter/waitress without feeling sheepish! A great solution to this culinary dilemma is offered by Derek Barnes, chef/owner of Derek’s Culinary Casual, one of Sarasota’s most innovative restaurants. His menu includes a Foodnotes section which defines many of the culinary terms used in the food descriptions. Culinary Adventure: Used to categorize a restaurant which may not have all the expected attributes of fine dining, yet serves very good, specialty prepared foods. In other words, there may be something lacking such as décor, locale, menu selection etc. but the quality of the food trumps all. Culinary Explorer: An individual on a quest to discover the newest or best restaurant; often very knowledgeable about food, wine, and a wide variety of restaurants. Food Channel Foodie: Amateur to semi-professional chef always looking for new food combinations to taste and try to prepare at home; cooking styles may vary but focus is always on the ingredients. Foodie: An individual focused on fine food, wine, and the latest food trends. Quality is of utmost importance and price is not a factor if the quality is commensurate; not to be mistaken for a food snob. Food Snob: An individual keenly interested in trying the latest and greatest ingredients and newest restaurants; price is never an issue; will only dine in a limited number of restaurants; trendy. 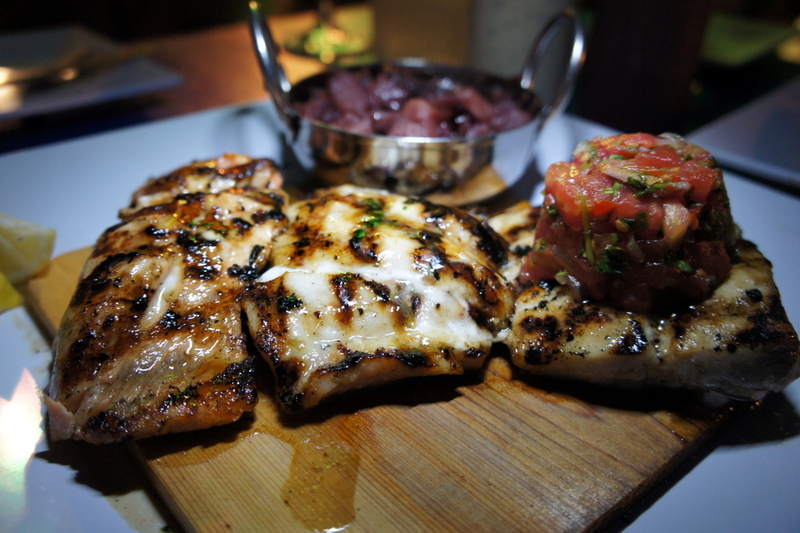 Chef Darwin Santa Maria and flavorful food may be synonymous in Sarasota. 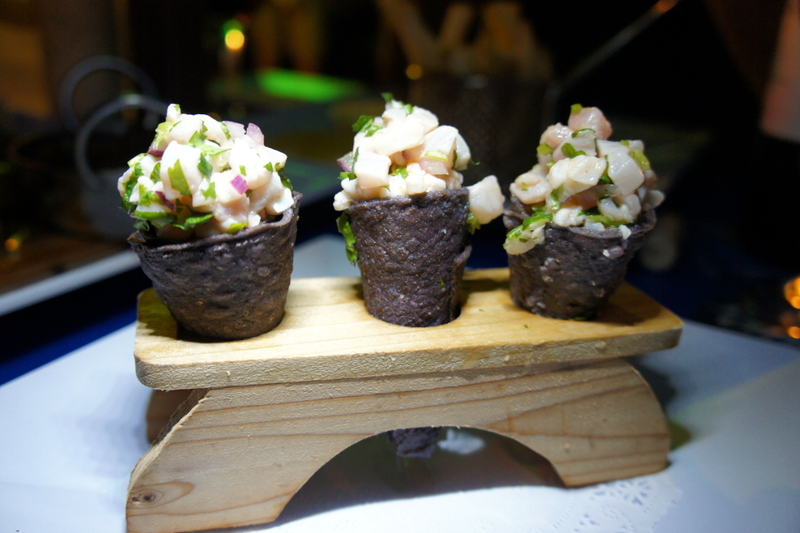 Darwin has created and served his version of Latin fusion cuisine in a number of Sarasota venues for over a decade. Although a number of stories have been written about Darwin’s culinary skills and talent, I wanted the backstory on Darwin’s culinary evolution. Here is what I found. JLQ: Many things have been written about you, so I would like to focus on something you would like the Sarasota area to know about you but has not yet been written. Any thoughts? Darwin Santa Maria: Yes, one thought might be the inspiration behind my cooking; that which inspires me to do new things, to keep going. I do not think anyone has written about that. JLQ: Sounds good. Before we explore your inspiration, can you share your culinary background? DSM: I was born in Peru, came to Miami as a child, went to high school in Sarasota and returned to Miami to go to Johnson & Wales’ culinary college. I graduated from Johnson & Wales and was expecting to travel. My plans were to go to France and Hawaii, but before I left on such a long journey, I wanted to return to Peru and visit my father. JLQ: So what happened when you went back to Peru? DSM: I went back to visit my father and I reconnected with a childhood friend. As kids and families we did everything together, but I did not see her for seven years and now she was a grown woman! We started dating and I decided to return to Sarasota and visit my mom. JLQ: I presume your plans for travel were altered? DSM: Yes, I decided to give Sarasota a try and worked in a number of restaurants starting as a line cook and working my way up from there. I was very fortunate to work with people that let me do my own thing and I learned from them. JLQ: What did your early working experience teach you about the restaurant business in Sarasota? DSM: I learned there was an opportunity to introduce Latin food and spices to the Sarasota diner. I had purchased some of my own chilies and spices and experimented with certain dishes. We were getting requests for Latin parties and specials. People were enjoying the new food. It was very exciting. DSM: Well, I got married in 1999, went from sous chef at Michael’s on East to the Executive Chef of Fred’s and was named as one of the Top 10 Chefs in the nation by Food and Wine Magazine in 2001. JLQ: That is a great deal of success and stress in a short amount of time. How did you handle it? JLQ: What happened when you returned to Sarasota? DSM: After my experience in New York and the positive response to my food, I decided it was time to open my own place. I found a small space on Clark Road and the first Selva was born. I was nervous but confident we would do well and it was busy right from the opening. A few years later we moved to a larger downtown location. Business was good but very busy and time consuming. Although things were going well, I did not feel satisfied. There were many conflicts happening at the same time. JLQ: So you were being pulled in different directions at once. How did you resolve these conflicts? DSM: Yes, that is true. The business was taking center stage in my life. This was not good because at the same time my wife and I were trying to start a family. We adopted our first son. My father became ill in Peru, and the demands of the business continued to require more time. My wife decided to return to Peru while I sorted out the details of the business. I decided to give up the partnership and return to Peru. I put my family first. JLQ: What happened when you were in Peru? DSM: While in Peru, my wife became pregnant with twins. I had the opportunity to relax and regain my energy and culinary creativity. I thought about opening a restaurant in Peru but decided my heart was in Sarasota. I did some work with other restaurants and then the opportunity to do my own came about and Darwin’s on 4th was born. JLQ: How will Darwin’s be different for you? DSM: First of all, I learned from my prior experiences. My passion for cooking comes from my family, and that energy is strong. I know how important that is to me. I am working to maintain a good balance between work and family. In the past everything came so fast; the balance was not right. Now we are starting out with the right balance with room to grow and be flexible. DSM: I know Sarasota is the place I want to be, and Darwin’s on 4th is the place where I want to share my food with friends both old and new. JLQ: Thank you for sharing some of your previously unshared thoughts with us.